Recently released data by the Debt Management Office reveals a further increase in Nigerias debt stock as at the end of 2017Q3. 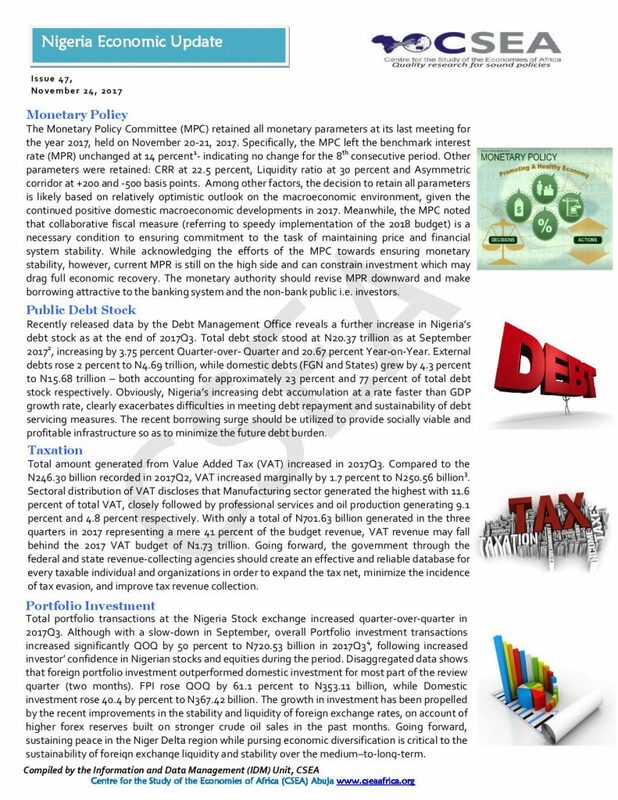 Total debt stock stood at N20.37 trillion as at September 20172, increasing by 3.75 percent Quarter-over- Quarter and 20.67 percent Year-on-Year. External debts rose 2 percent to N4.69 trillion, while domestic debts (FGN and States) grew by 4.3 percent to N15.68 trillion both accounting for approximately 23 percent and 77 percent of total debt stock respectively. Obviously, Nigerias increasing debt accumulation at a rate faster than GDP growth rate, clearly exacerbates difficulties in meeting debt repayment and sustainability of debt servicing measures. The recent borrowing surge should be utilized to provide socially viable and profitable infrastructure so as to minimize the future debt burden. Recently released power sector report by the National Bureau of Statistics records a total average energy generation of 2,548GWH by 25 power stations, from October 2016 to December 2016. Daily Energy generation, attained the 2016Q4 highest level of 3,859.6MW in October 2016, and a lowest level of 2522MW in the same month. On the average, current daily energy generated which is below 3,000MW, prompts system malfunctions. Thus, the irregular power generation and supply experienced in recent times is attributable to shortage of gas owing to non-functional major pipelines, in addition to the inability of GENCOs to make payments for the available gas supply. Given the recent challenges to power supply, efforts should be geared towards the diversification of electricity generation. Government should consider investment in renewable as well as coal energy to complement gas power supply. This brief examines two measles immunization programs for children of age 9-23 months in an effort to boost measles immunization coverage in Borno State: free immunization against measles with media awareness campaign and free immunization against measles with house to house campaign.